I’ve always liked chicken Kiev, though usually it’s been in a restaurant, or from a pre-made one back when I lived in the UK. I like the idea (garlic butter in a bread crumbed chicken breast) so I thought I’d have a go at it myself, from (almost) first principles. I looked around and found quite a few recipes, but in the end they morphed something of my own. Some suggested deeper frying in corn oil which didn’t appeal to me, so I went for a more oven based approach with olive oil. Prepare the chicken by cutting along the thickest part of the chicken breast to form a pocket as large as possible – you may even want to remove some of the chicken for this (I didn’t though). Get all your filling together in a large bowl, and mix with a fork until it’s well mixed together, then leave it to sit. Get three plates or bowls, and put a couple of tablespoons of flour in one, and in the other beat the egg. In the third bowl we want fresh breadcrumbs – get two or three slices of bread, minus the crusts, blend them for a couple of minutes and then put them in the bowl and let then dry a little. Now stuff the butter/garlic mixture into the pocket – really pack it in there – then drag it in the flour, then the beaten egg, then roll in the breadcrumbs. I then closed the pocket with a couple of wooden skewers to keep as much butter in the chicken as possible. 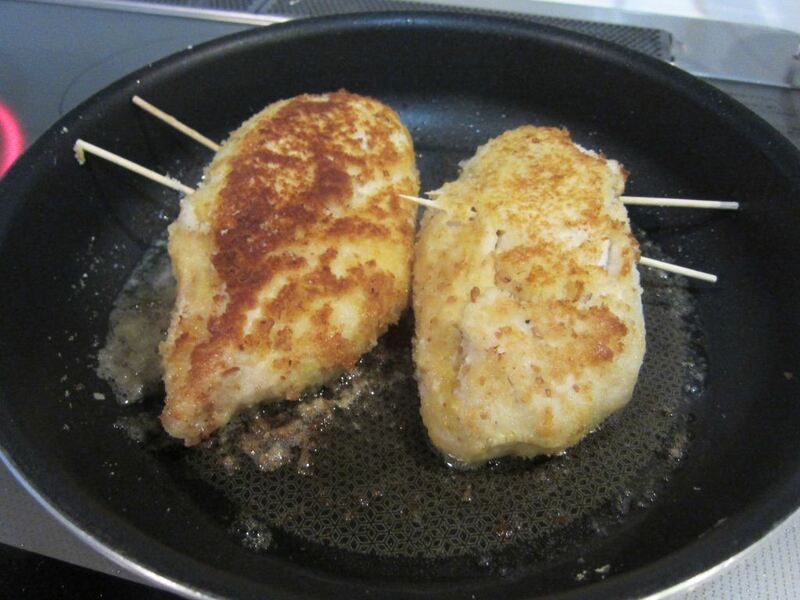 Heat up a very thin layer of olive oil in a frying pan, and place the chicken in it, turning when it looks browned. Now put all of this (including the olive oil) into the 200C pre heated oven for 18-20mins. We have a handle-less frying pan which we simply placed in the oven, but an oven tray would be fine too. Then, when the time is up, serve and eat! We had ours with boiled new potatoes and some pickles since it was a hot day – you can use the butter/olive oil in the oven tray as some sauce for the potatoes. I really enjoyed it, though I’d like to make my own bread for the breadcrumbs too if I had time. The only thing I’d say is that it might be better going for smaller chicken breasts. 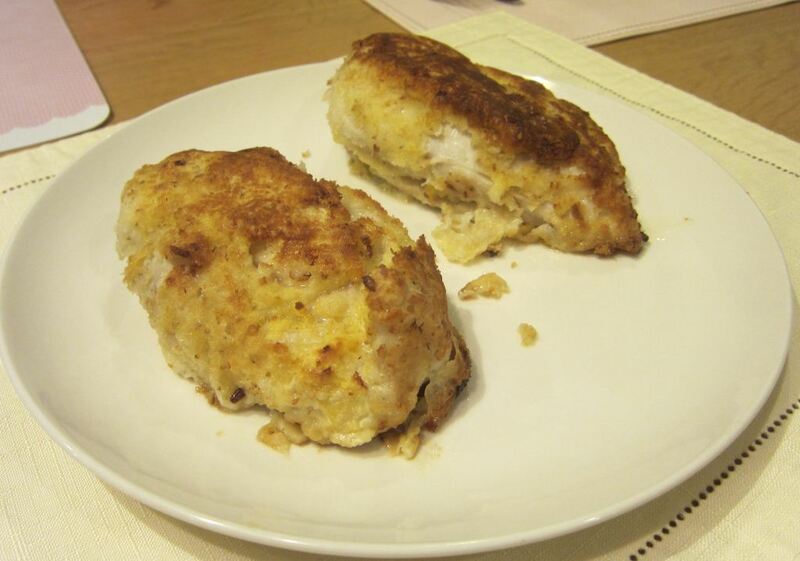 If you’re in the mood for something else along similar lines, try ‘double stuffed pork chicken breasts’, which are delicious too, if something of a meat overload.